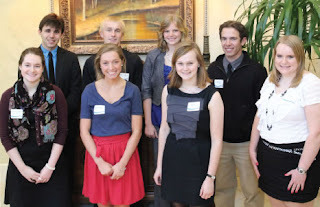 News from LMCU: Congrats to our 2012 Hutt winners! Congrats to our 2012 Hutt winners! On May 2, we awarded our eight Hutt Scholarship winners with $2,000 each during an award luncheon held in their honor at the Cascade Country Club. Pictured back row, left to right: Jacob Pope, Brandon Skinner, Abigail DeVries and Andrew Farmer. Front row, left to right: Katherine Matheson, Victoria Viveen, Kayli Horne and Emily Evers.